Waterbury "Willard No. 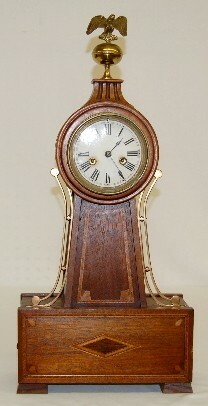 10" Mantel Banjo Clock has pendulum; 8 day; spring; half hour strike; gong; porcelain dial; brass movement marked Waterbury; mahogany inlaid case. (Top finial does not match book but looks good.) Running and gongs. 23"